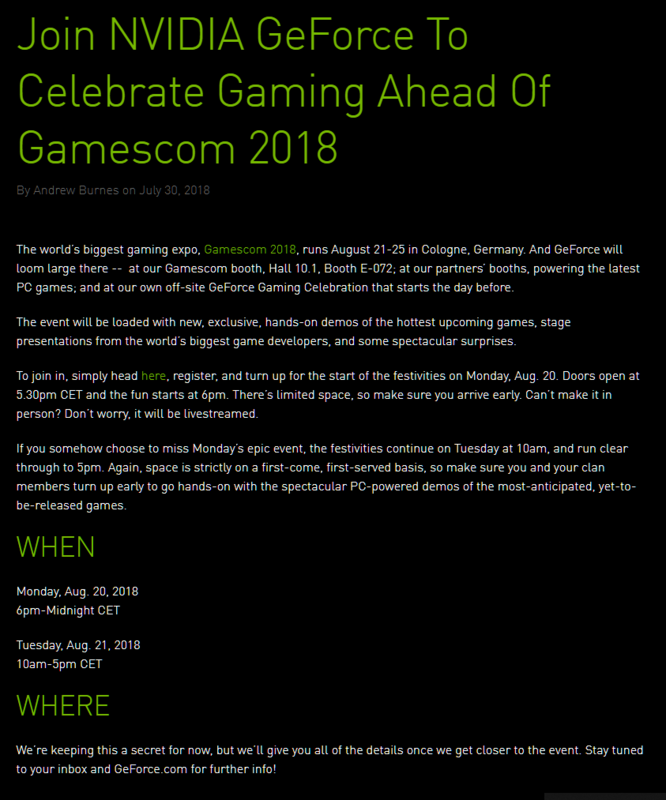 "Well, the rumors seem very credible now as NVIDIA has themselves announced to hold a huge event ‘GeForce Celebration Event’ which will take place on 20th August at Gamescom 2018." Professional cards seem to be on the 13th, with a live stream. Hopefully they have immediate or near immediate availability like the 10XX launch. Probably another month to wait for open air designs. Hopefully less. I do hope we see a big perf/w boost. Jensen Huang will probably show up and say new Geforce not due for a looong time, stick to Pascal... then a week later we see the reviews up. That seems doubtful. Even announcing an event makes people put of purchases. If there were truly nothing, why say anything at all? My guess is that we see a repeat of Pascal with availability for FE cards in the first week to month followed by third party designs. All of the rumored 1060 chips that were being returned can be repurposed. It wouldn’t be the first time mobile parts end up being rebadged parts from the last generation.